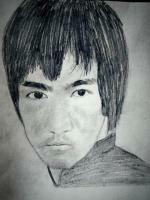 I show you a couple of cross drawings and will briefly explain about each. Crosses are part of our culture and history. It seems they are with us till the end of our days and beyond as we also have crosses on our graves. In Europe you see them in old towns everywhere on church towers or cemeteries. The cross is associated mainly with religion because it is used in many worlds’ religions. The cross is however a symbol. In Christianity it symbolizes the martyrdom of Jesus Christ because crucifixion in those days was very common form of execution. As a symbol it has way too many meanings (not only religious) to describe them all here. So cross drawings is definitely a theme worth to consider. 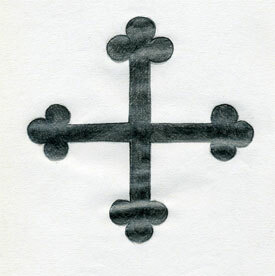 Many cultures use cross in their religion, on national flags, in heraldry and also as markings. In Japanese (and Chinese) Kanji cross symbol in writing means number 10. 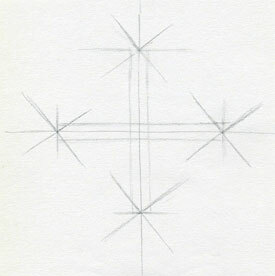 I picked up a couple of crosses and will show you some simple techniques how to draw them by free hand without ruler. I know, the lines aren’t exactly straight; I do not mind that much and hope you are OK with it too. 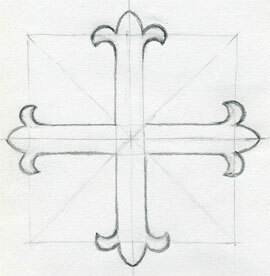 This cross is the simplest one and very easy to draw. 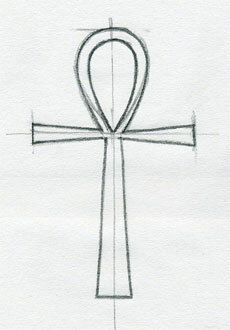 It is also called Latin Cross the symbol of Christianity and Crucifixion of Jesus Christ. 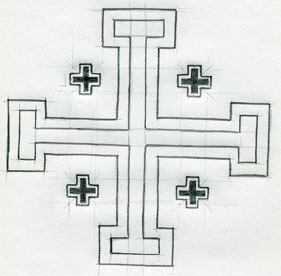 By free hand draw a simple cross as you see on the picture. Do not use ruler! Consider this as a kind of exercise. 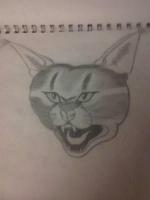 Lines may not be straight but it is OK. See the lines I drew, they are not straight at all. 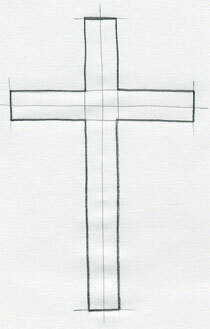 The above simple cross lines will serve you as center lines around which you draw the body of the cross. Draw two parallel lines around each – horizontal and vertical center line. 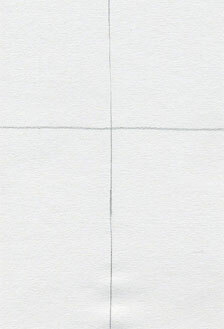 Distance between the outer lines and the center line will determine the width of the arms of your cross. 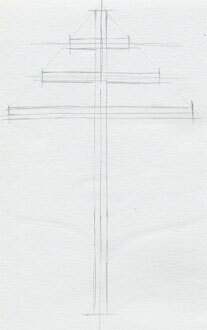 Decide the length proportion of arms and use darker pencil line to mark and outline the final shape of your cross. 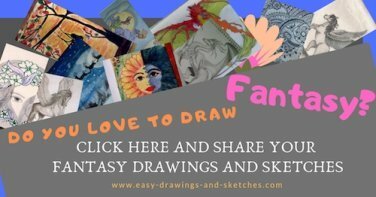 You can use this easy and simple system for all cross drawings and apply it as necessary. Finally, darken or shade the cross as you wish. I made this one very simple. 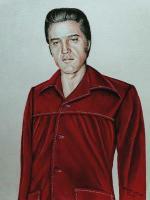 Try a different shade or color tone; it doesn’t need to be black. This is absolutely my favorite one! 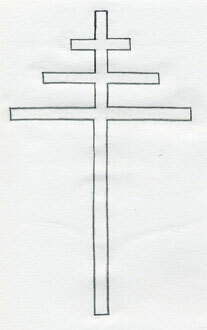 If I make cross drawings, I would draw this one. The shape of this one is very interesting. 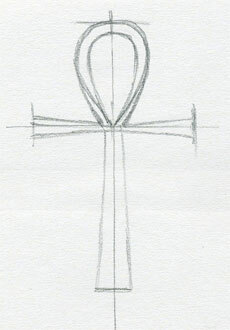 It is also called Cross Of The Nile or The Key of the Nile. 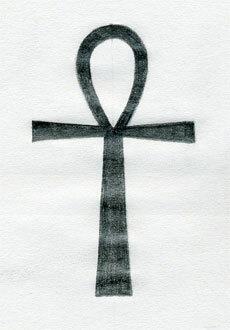 In Egyptian hieroglyphic character it means an Eternal Life. 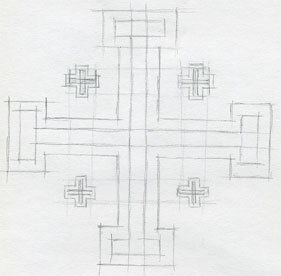 I use exactly the same technique for cross drawings as on the above Christian Cross. You may be surprised to see this because it does not really look like a cross you expect. You can find this unusual cross on some of the old cemeteries. 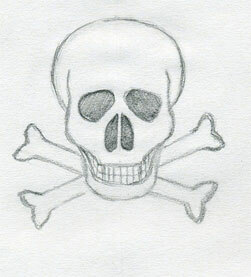 This cross symbol often appears on pirate ships in movies. 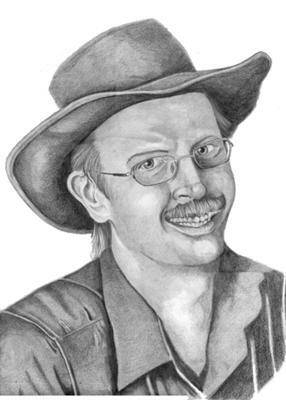 It may be fun to add this into your collection of cross drawings. 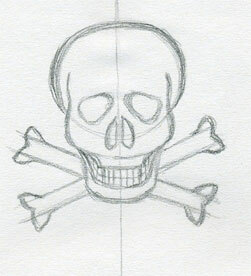 Before you draw this cross check out first the simple method of how to draw skulls. 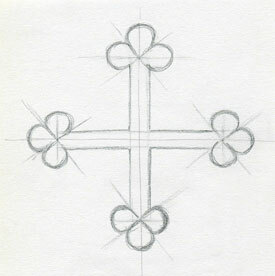 Every arm of this cross ends with a trefoil as a symbol of Christian trinity. 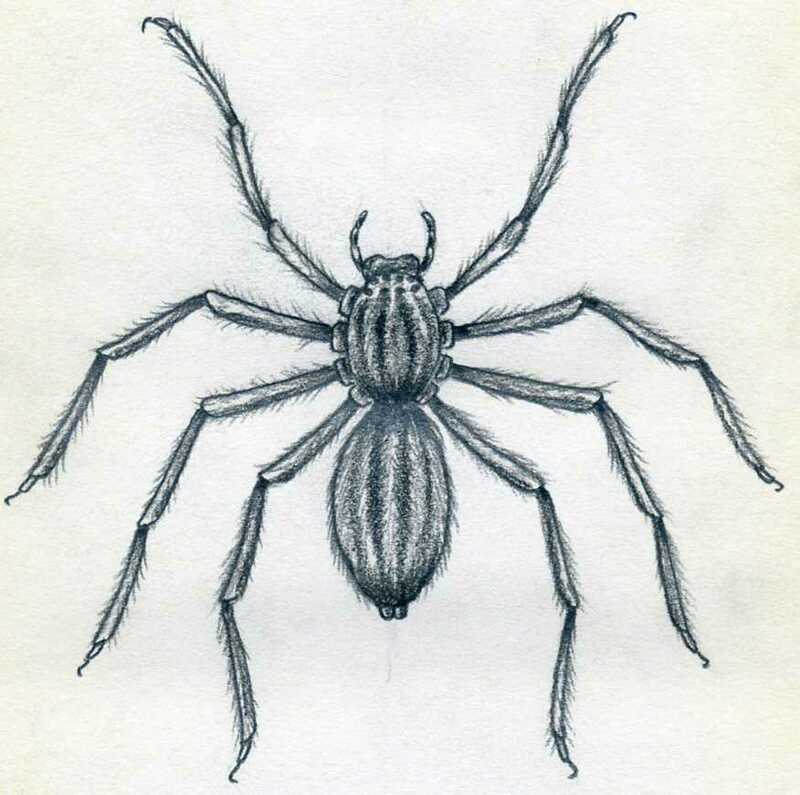 It was often painted on medieval shields as you see on this drawing. 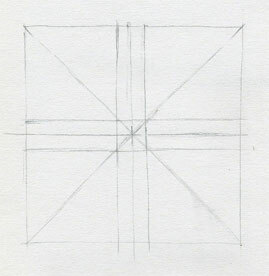 Here I made diagonal crosses on each end of the four arms which will help me draw the trefoils. 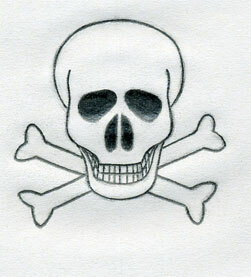 This is a simple drawing of medieval shield with Cross Buttony symbol on it. 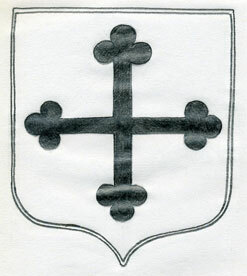 While Cross Bottony’s arms end with trefoil, Cross Fleury arms end with flowers. 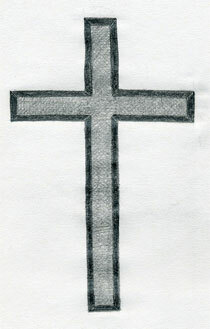 This cross is very nice to draw as a decoration. On each arm there are three petals which represent Faith, Wisdom, and Chivalry. 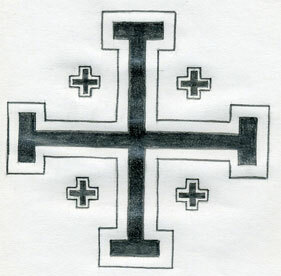 This is the Crusader’s symbol of Jerusalem. Interesting are the small four crosses in every corner. These may symbolize the four directions in which Christianity spread from Jerusalem. 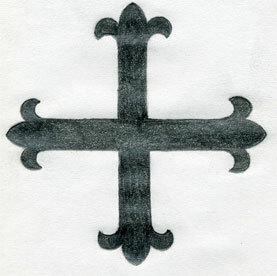 It is also called Crusader’s Cross, as Pope Urban II gave Crusaders a papal banner with this symbol.